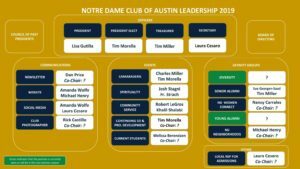 In addition to the incredible support that the ND Club of Austin receives from alumni in Austin, friends and partner organizations, primary management is voluntarily provided by the team shown below. The Club encourages you to participate in any way that you prefer – all involvement is welcome. Subscribe to our newsletter (on the right), come to an event, or visit during our next Club meeting. 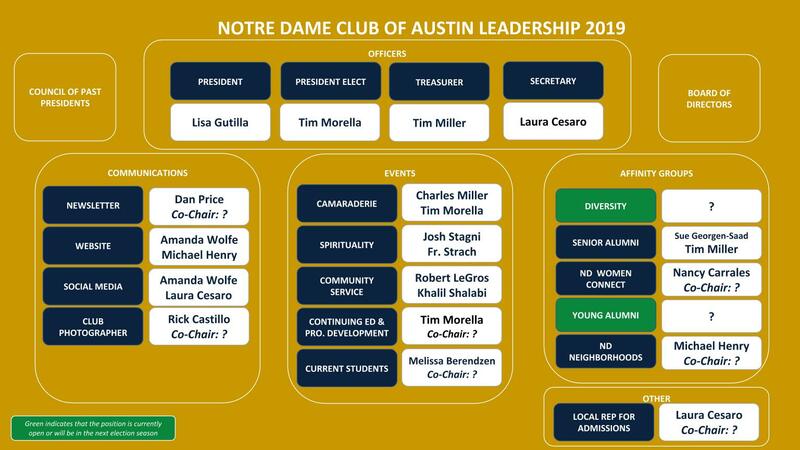 Please email the Club at info@NDClubOfAustin.com or lisa@NDClubofAustin.com if you’re interested in a particular open role, team or even an area that’s not on the chart. Email us if you’re interested in helping. If you’re interested in a position that currently filled, that’s OK too – you can be a member of that team. In the ideal buddy system, everyone in a leadership position will have a Club member serving as backup to spread the workload and step in, in the event of schedule conflicts, travel, family commitments, etc. Our Two in the Box system presents a great opportunity for Club members to learn about the inner workings of the Club and ease into leadership roles if that is of interest. Buddies can also serve by simply supporting leaders with scheduling, phoning, emailing and other routine tasks. The Diversity Group Leader arranges educational and celebratory events to honor the diversity of the club and our region. Past events have included Asian cooking class, Dia de la Muertos lunch and exhibit visit, Black and Junto activism in Austin, and others. If you are incredibly hip, and what SMC/Domer alum isn’t, this is the Club leadership position for you. In addition to the positions identified above, the Club is seeking a number of Domers to serve as co-chairs to assist those currently chairing groups within the Club such as Diversity, Social Media, ND Women Connect, Camaraderie, and others. The co-Chair position is a great way to ease into Club leadership while making a contribution and learning the ropes.